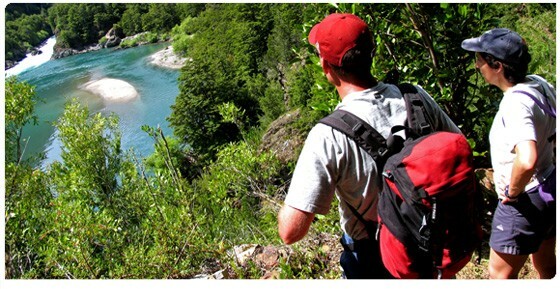 This Trekking and rafting trip two combines two of the best things to do in the Futaleufu river valley. Put this on your bucket list. Riding the spine of this river as it flows through this isolated portion of the glaciated Chilean Andes is an un-paralleled experience. These two days of rafting do not require previous experience. In these two days there is one class 5 rapid that is an optional walk around. The next portion is trekking the Patagonia "Route of the Cowboys" a 4 day trail trip back in time that few people will ever have a chance to experience. It is sure to be a life changing cultural journey. We will visit small remote working ranches, outposts, and settlements without roads in Patagonia, Chile. We wiil be staying each night in different ranches or cabins with bed and linens and prepared meals. You can pack light with a day pack. The accommodations are rustic country but, sanitary, ordered, and cozy. Our Chilean hosts are are landowners we have advised them to ensure our high quality of service but maintaining the Patagonia style. They look forward to the few visitors they get at the remote ranches. This is a trekking trip with a complete wilderness cultural rhythm. For a young family this is a true education! . Hearty meals served while sitting around a rancher's wood stove will give you a peak at the rare Patagonian way of life. Here life is similar to the frontier days of the American west over 200 years ago. The cultural and natural experience cannot be matched anywhere. This vacation is the REAL DEAL. It is an insider's look at Patagonia and its people. This is a very unique horseback riding vacation. Fly to Miami and connect on an over night flight to Buenos Aires Argentina. Welcome to the warmth of the southern Hemisphere in summer. Day 2 Saturday: Travel to Trevelin, Patagonia Argentina. Early morning arrival in Buenos Aires. Change airports with a taxi or shuttle bus and catch another flight to Esquel Argentina. Trevelin Argentina is a charming mountain village gateway just 45 minutes from the Esquel aiport and 45 minutes from the Futaleufu River in Chile. Check into the Casa de Piedra hotel and walk to one of several Argentine restaurants with the Chilean Andes in view. Unwind, relax, and get a good nights sleep before the start of your trip the next morning. After a relaxing night's sleep at a hotel in the quaint Welch town of Trevelin deep in Patagonia Argentina, we begin this exciting trip with a quick shuttle across the Chilean/Argentinean border and into the Futaleufu Valley. After clearing customs we go direct to the Futaleufu put in where we will meet your guides and rafts. After changing into our river gear, your luggage will be whisked away and magically show up at your tent or cabin at our river eco-camp before you arrive. After the introduction of whitewater and paddling skills we encounter a section of mild class II water flowing through the Las Escalas valley. A couple of hours later the river shows its wild side and we encounter "Zeta" and "Throne Room", two of the most challenging (Class V+) rapids on the Futaleufu. We study and will portage both. After the portages, we get into our first action, the section called "The Wild Mile" which contains Tres Islas (III), Roller Coaster (III), Honorable Mention (IV minus), Wild Mile (IV minus) and the climatic Thing. The excitement doesn't stop until we get to the confluence of the Futaleufu and Azul rivers as we take out on the unspoiled beach at our Camp Tres Monjas with the stunning peak of the same name standing guard. At our secluded camp you find your luggage in your RiverNest cabin. You will be given a tour following trails to the sauna, showers, drying shed, bathrooms, and dining hall. This idyllic spot will serve as the take out and put in for your activities for the rest of the week's adventures. This setting is arguably one of the most stunning on the river. Relax in the sauna and ready yourself for a sit down meal. This has to be the most fun and action packed day of rafting, anywhere on earth. We take off from our sand beach at camp and head downstream to a couple of warm up rapids before the river takes on an extremely powerful nature, with the longest rapid on the Futa, the "Terminator" (Class V). After a careful scout and plan we will run this rapid. Just below, we'll have to negotiate the hole filled "Khyber Pass" (Class IV+) and the Himalayas (Class IV), with perhaps the biggest standing waves in the hemisphere with a huge pool below. After Lunch we run another complete section called the the Heart of the Futaleufu. This section, from the Zapata swinging bridge to the Puente Futaleufu, includes five miles of Class IV+ rafting action. Rapids such as "Entrada", "Pillow", "Tiburon", and "Mundaca" with its must-see explosion hole, will keep you on your toes. Though drop pool the pools are short and the action non stop. As we begin our final section of river today we will thread through the well named Maso Manos rapid getting ready for the magical and daunting rapid Casa de Piedra. Casa, as commonly called by our expert guides, is a long class V rapid appropriately named for the house size rock that must be navigated before flying past the helicopter eddy and down through a maze of truck size holes and waves. The take out is at a spectacular cliff wall with towering glaciers in the distance. After the trip we return to our Camp and take advantage of our sauna and massuse and work out any sore muscles you might have after a big day of paddling. Day 5 Tuesday: Trek from Devils Throat to mid-lake Lago Espolon. We wake up at your RiverNest cabin at Campo Tres Monjas. After breakfast we pack up your luggage that you will see at the end of the Trek. You will only need a day pack for this trek as we will be staying at ranches with bedding and prepared meals. The trail head starts with a spectacular view of the the Teta peak, Lago Esplon and a the pristine Espolon river exiting through the impassible Devils throat gorge. Our four day trip takes us along three lakes and all away around the Teta peak. Today we will walk in the Forest with view of the Lake. We stop at a ranch in the woods late afternoon a traditional Chilean meal before settling in to a good nights sleep before the trek tomorrow. Here we will stay in lake side cabins next to a gravel beach. The view across the lake is to the high snow capped mountains in a complete wilderness area that is rarely accessed by humans. Day 6 Wednesday: Trek the forest along the shore of Lago Espolon to the upper Rio Espolon. Today we continue our trek most of the day along the lake till we arrive at the small settlement of Espolon. This is a trip back in time. We can visit the off the grid school and a small church surrounded by remote ranches. The only way to this remote settlement is by trail or getting on a small ferry that crosses the lake several times a week. At the end of the day we stop at a homestead on the upper Espolon where we spend the night. We will depart early in the morning hiking up on a trail climbing some 600 vertical feet giving us a great view of the Espolon Valley below and the mountains and the lakes of the valley. We descend through an old growth forest and cross a pure crystal clear creek coming from the high Andes that defines the border with Argentina. After the stream we enter an open valley with one ranch house on the lake Lago Las Rosas. This is living in a time machine. Day 8 Friday: Trek from Remote Lago Las Rosas to the Village of Futaleufu. After a relaxing nights sleep in a rustic Patagonia ranch house on the lake we will begin our trek along the Noreste valley. The Noreste valley is steep as we desecnd down an incline surrounded by a series of pristine turquoise lakes. You will experience incredible views with the peak Cerra Teta in the background as we make our way to the village of Futaleufu. Upon arrival in Futaleufu, Our vehicles will be waiting to take you to the border and where you will meet your taxi for a ride to Trevelin. Check into your hotel, take a shower and change clothes before enjoying your last night in Patagonia. There are a handful of outstanding and reasonably priced restaurants in Trevelin that we can recommend. Relax, recover and look back on the exciting week of trekking and rafting. You wake up in Argentina, there is plenty of time for breakfast and relaxation before you take taxi from you hotel to the airport in Esquel. back to Beunos Aires and connect on to an international flight to your home country. If you are departing to Bariloche you can pick up a morning bus from Esquel or arrange a private transfer direct from your hotel. Special Flexibility: Exchile will be flexible to make your trip a total success. The actual program for your custom trip will vary according to the desires and skill level of your group, weather, or other factors. Patagonia has constantly changing weather patterns that might affect what day is best for a certain activity. If a certain part of your trip is not possible due to danger risks and weather extremes, our experienced guide staff will work with you to figure out the best possible option to substitute for the weather complications. If you have any concerns, please feel free to ask us more about the situations and what is guaranteed on the trip. Included: Your described trip, guiding, instruction, activity equipment, local transportation, shuttles, all meals, wine with dinner, accommodations at our eco-camps, cabins, ranches or lodges, while on your trip. We offer a free pick up on Sunday mornings at 9 am in Trevelin at your hotel, and drop off to your hotel in Trevelin, Argentina on Fridays at 9 pm. See the packing list of your activity, for the specific clothing that is required. Not Included: All en-route transportation, food, pre-trip hotel(s) from your home town to your trip pick up point. All en-route transportation, food, lodging, post-trip hotel(s) from your trip drop off point back to your home town. Once you are traveling on a exchile trip you should have no extra expenses unless you are desiring, laundry services, massage, gifts, or additional alcohol beyond what is included. If you want to add activities that are not listed as options on your itinerary we are super flexible to cater to your wishes. However extra activities may be subject to an additional charge if not included on your day by day intinerary. How to organize your En-route in one step: We can have Gilda (G & G Travel and Tours) our recommended travel agent arrange all en-route transportation, pre and post trip hotels for your exchile trip or trips. Give her a call and compare prices. She often beats internet fares. Expediciones Chile and G & G Travel and Tours are not financially responsible for your travel complications getting to your trip pick up point and back home from the trip drop off point, HOWEVER, we will be relentless allies 24/7 in offering our influence to help solve any issues that you may encounter in route. This is our part of the world and we are extremely well connected. Our clients provide significant business for the transportation services we recommended, they work with us and they know that we aggressively represent our guests in finding solutions while they are in route to exchile trips. We recommend purchasing travel insurance. Alternative Trip Drop off spot: Futaleufu for a transfer to Chaiten and flight back to Puerto Montt Chile. Season: Regular Season is Dec - March. Extended Season/Charter trips 4 person minimum /Nov 15- Dec1 and April 1 - April 15. Region: Remote Patagonia, Chile and Argentina. Lakes, Rivers, Sites Visited:Futaleufu river, Rio Azul, Rio Espolon, Lago Lonconao, Lago Esplon, Secret Lagoon, Campo Tres Monjas, Futaleufu Chile, Trevelin Argentina. 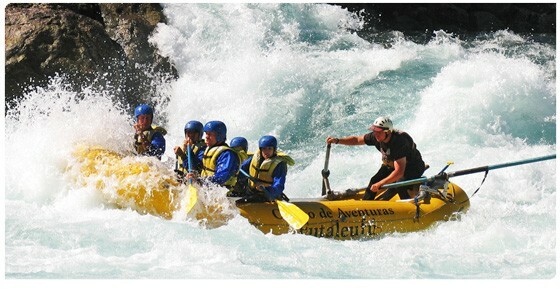 Adventure Travel in Patagonia, Chile Rafting & Argentina Rafting. Torres del Paine and FitzRoy trekking. Chile & Argentina Patagonia travel information. Secrets of Patagonia Tour. Information about the the seasons weather and climate in Patagonia, Chile & Argentina. Sea Kayaking Patagonia from the Andes to the Ocean. Yoga Travel Retreat Combine yoga with your favorite multisport activity with this yoga travel retreat. 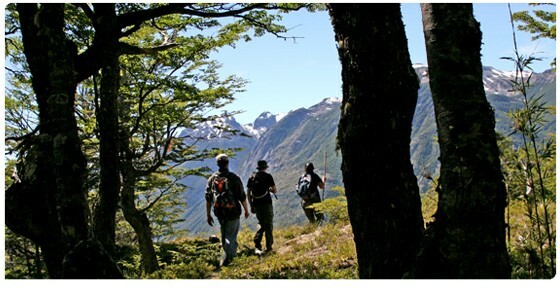 Checkout our custom eco tours of the Futaleufu Valley that include bird watching and nature treks. instruction from our paddling school. Expediciones Chile resource page to find other outfitters around the globe. Checkout the instructional and corporate programs we offer. Information on travel agent commissions and discounts can be found here. Skiing in Chile The Andes Mountains have some of the world's greatest skiing. Skiing Chile, Patagonia and Argentina. Guide School Thinking about a guide job on the Futaleufu? Check out our whitewater guide school. Whitewater Rafting and Kayaking Jobs and outdoor employment opportunities.